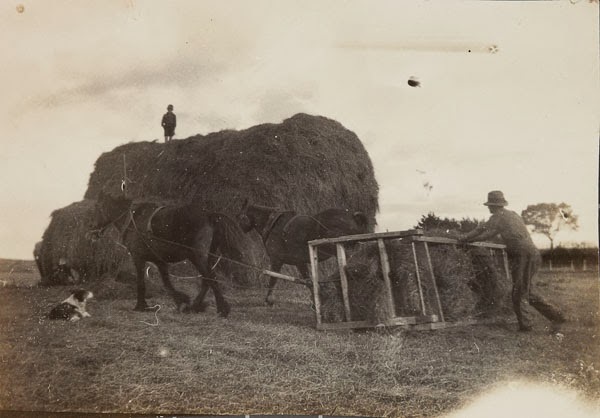 Driving in the outskirts of Auckland at this time of year you are bound to notice those large rolls of hay perched on hillsides, or perhaps the smaller oblong bales dispatched along the length of a recently chopped field. 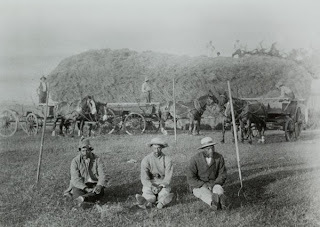 In the past the making of haystacks was an activity which provided a way of connecting the local farming communities and local families with one another. 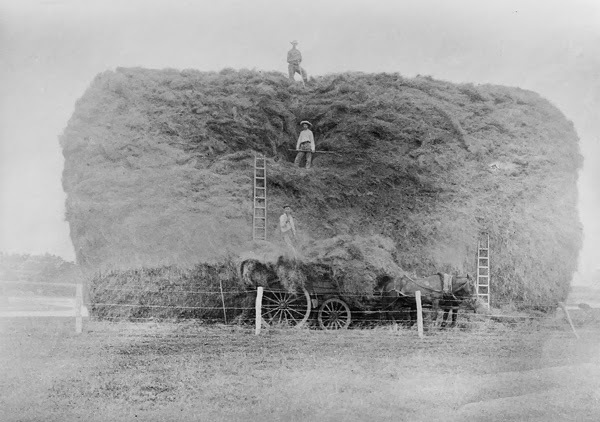 Before the advent of hay-balers these giant piles of hay required far more labour, tenacity and skill to create. The stack in the photograph above was made up of hay from fields 10 acres in extent and was estimated at 60 tons in weight. Reg Wyman is on top of the stack and Geoff Mellsop on the ledge halfway down. 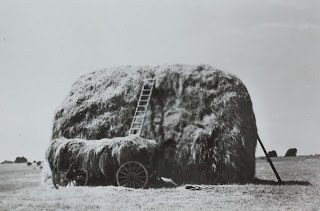 The photographer of the image above recorded the following comments from Arthur Dennis, a retired farmer of the area: “There was a real art in building hay stacks. This one was about 25 feet high. Keeping the hay inside the stack dry was important so it didn’t get wet, otherwise it would be useless for stock feed. We took care to lay the hay down sloping it towards the outside, so droplets would run along grass stems away from the stack. That’s where the main skill was needed, and the man who did it was called the ‘stacker’. He stood on top of the stack, carefully laying the hay down. My job was to constantly keep enough hay in front of the stacker for him to work with…I was called the ‘crow’…We did by stages. First we forked the hay onto the dray, and then standing on this heap, we forked it up to the second stage. When this second layer was complete, we got a gate and laid it flat on top of it, but sticking out a few feet. We used this gate as a platform for forking hay onto, and building the next stage. The people who did this were called ‘forkers’ and they were usually tall blokes who could lift hay up a good height… when the stacker finishes on the top of the stack, he comes down and ‘combs’ the sides, rakes all the loose hay off the sides and combs the stack down and outwards so as to shed the rain off it and keep it dry”. The work of rural children was an important contributor to rural family economies too. During seasonal activities and at harvest times they would go out to help in the fields to help with the work. Horses were indispensable on farms until the introduction of motor-driven machinery and tractors from the 1910s. By the mid-1950s, farmers’ transition from horse power to tractor power was almost complete. Ref. Footprints 01094, Haymaking, Mangere, c. 1905, photograph reproduced by courtesy of Mangere Historical Society, South Auckland Research Centre. The photograph below shoes a horse dragging a home-made scoop laden with hay towards the haystack. New Zealand newspaper reports from the 1800s and early 1900s mention accidents resulting from the precarious nature of the work. The outcome of these accidents often resulted in serious injury and sometimes death. The article below from the Auckland Star newspaper relays a nasty incident where a young boy fractured his leg falling from a haystack.